The MDM cell line is established from mouse peritoneal mesothelium immortalized with large antigen SV40. covering the plate surface. At higher confluence, the MDM cells may be efficiently used as a feeder layer. protein and are expressing Wild Type (WT). The expression of EGFR was confirmed by Western Blotting. The EGFR WT cells are resistant to antibiotics Puromycin used as a selection marker. EGFRvIII cells are resistant to antibiotics Puromycin and G418 used as selection markers. stabilization of the walls of blood vessels, regulation of blood flow and angiogenesis. help sustain the blood–brain barrier. smooth muscle actin (ASMA), Desmin. 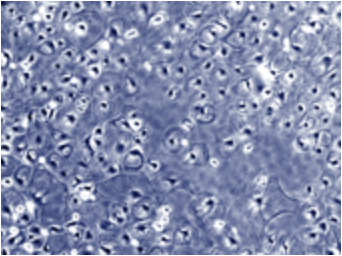 Celther Pericytes are isolated form brain.